It's the end of the day, so that only means one thing: GeekBytes. And mustaches. Especially mustaches. Like cats, mustaches have become somewhat of a fun meme, as well as a great charity fundraiser under the Movember guise. So here are a few quirky mustache-themed toys and gadgets to consider for Christmas gifts or stocking stuffers. Here's a great accessory that would make your car stand out: the carstache. Available in a range of colors, it simply attaches to the grille of your car or truck. The best part? The 'tache is fluffy! While this accessory is pretty cool, you may not want to drive through mud with it attached (unless you have a giant comb to clean it with!). You can get one for £26 ($40) on Overstock. You don't have to be a wine connoisseur to need a good corkscrew, so why not sneak in a mustache joke? A corkscrew needs something for you to get hold of to get the cork out of the bottle--another reason why this handlebar mustache corkscrew is a must-have. Get it? Handlebar, corkscrew? Um, anyway, this useful kitchen gadget will only set you back $10 and would be a great conversation starter, bad jokes aside. Feel all mustached out? How about bringing the fuzz to your dog? ThinkGeek currently has a rubber ball with a mustache attached, named the Humunga Tache. This sounds pretty basic, but the beauty of the item becomes apparent when the dog picks up the ball end--the 'tache instantly drops down infront of their face. 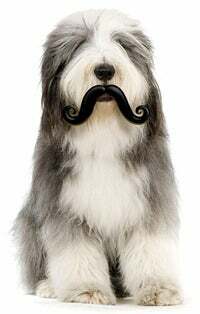 Who would have though dogs with human facial hair could be so cool? The ball costs $10, providing fairly-priced fun on Christmas day.